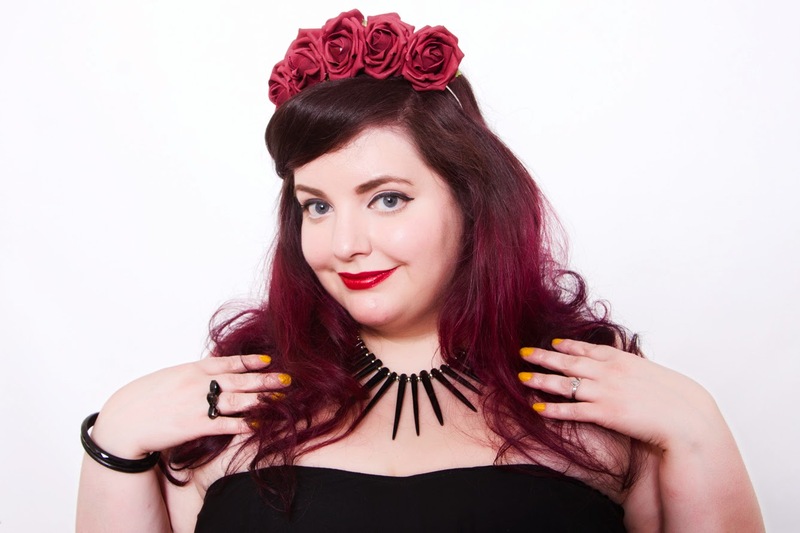 Wild Roses - Adventures from the bottom of the wardrobe with ASOS Curve, Tatty Devine and Frankii Wilde. Recently I had a bit of a clear out in my wardrobe and came across a bag of clothes which had been put away and resigned to never be worn again. Clearly I was being stupid at the time as I've managed to pull out three amazing dresses and whole lots of other bits which I cannot believe had been languishing in the darkness whilst I lamented that I had nothing to wear! One such dress was this high-low beauty from ASOS Curve. Brought several years ago, it was ignored as I couldn't find a cardigan to wear with it which worked. It never even occurred to me to just rock it as is, chubby arms and all! How times change! Art Deco Ring: Tatty Devine. I'm so excited to have rediscovered it, and can't wait to wear it out somewhere special soon.